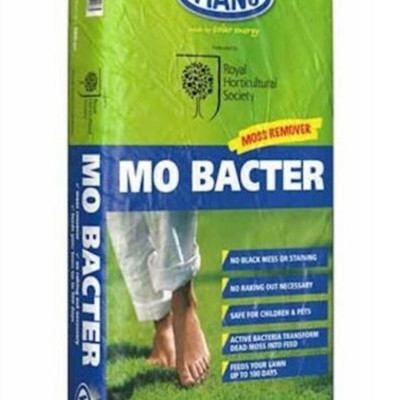 MO Bacter is a slow release organic fertilizer which kills moss, feeds grass and improves the soil all in one. The main benifit of MO Bacter is that their is no need to rake or scarify and it wont leave any unsightly black patches. The dead moss is absorbed naturally into the soil and leaves your lawn looking greener. The other benifit is that it is organic and so it is safe with pets and childern. It also will not stain pathways or stonework. Apply by hand or by a spreader at the rate of about one handful (200g) per 2 square metres. A 20kg bag will treat 200m2. It does not matter if it rains afterwards. MO Bacter works best when soil temperatures are about 10 degrees celsius so warm damp conditions are ideal. MO Bactor is best applied from April to July for healthy grass and moss elimination but can also be very sucessful when used in early autumn for acting as a moss control over winter. Keep MO Bacter in a cool dry conditions, stored in the plastic bag secured at the top. You can continue to use the product for up to 12 months after the bag has been opened. It should keep well if you ensure the bag is not in damp conditions. There are 5 main advantages; MO Bacter is organic; slow release; does not stain stonework; destroys moss, eradicating debris - thus resulting in no raking. The temperature needs to be above 10 degrees celcius for the product to work.